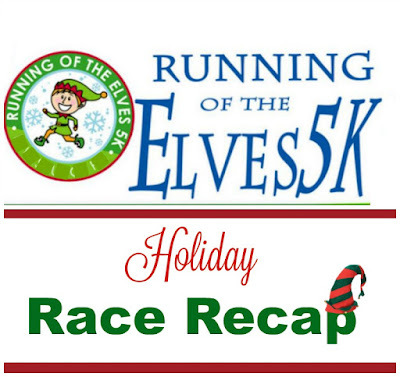 On Saturday I ran the Running of the Elves 5K. I registered for this around Thanksgiving (cus I wanted to get in before the price increased), but I have to admit that a few days leading up to the race I was certainly thinking about just blowing it off. The weather man made it sound like it was going to be SO cold on Saturday. I had done a few runs earlier this week and was dressed properly (I thought) so I wasn't cold at all. I assumed I would wear something similar for race day and I would be fine. However, I forgot that my runs during the week were done at 4:00 pm in the afternoon and the race on Saturday would be earlier in the morning. On Saturday morning my running buddy text me to see if I was going and by that time I was already up and ready so he decided he would run too. I don't think either one of us has ever ran a race in December before so we must have been expecting the worse. We both had layers upon layers on. I wore those tights I mentioned in my Weekly wrap, my Christmas socks, a running skirt, a long sleeve race shirt, a (thin) fleece lined jacket, my windbreaker, and my Under Armour hood/mask. My buddy wore thick pants, an Under Armour base layer, a T-shirt, a fleece zip up, and a pull over sweatshirt. Plus, he was kind of bummed that he didn't think to wear anything festive (since apparently he was more focused on staying warm) so I gave him that festive hat and God love him he wore it the entire time even though I knew he HAD to be hot. Yes, we were WAY over dressed! One fun thing about this race is that EVERYONE was decked out in holiday gear. There were runners in full Reindeer costumes, there was a snowman, multiple Santas and Mrs. Clauses, and a ton of elves. Check out this dog that was there. He almost doesn't look real does he? We all met in the cafeteria of the local high school and they had hot chocolate and donuts for the runners. We didn't have any though. You could also purchase T-shirts. I understand this is a local race but I think t-shirts should be included in the registration. They had some "sale" shirts from previous years and there was even one design that didn't have any date on it. They were actually nice long sleeve shirts and I considered purchasing a red one but when I came back around to this table they were gone. Okay, lets get to the race start. Before we headed out, there was a nice candy cane arch set up that we could have got a photo under but we didn't. There were no corrals but the race director did announce "Any 5 minute mile Runners come up front". At this point everyone chuckled and we all moved back. She called 6 and 7 minute milers to line up and then the rest of us just grouped together behind them. Something unique about this race is that we were told that there would be gifts out and around the course and if we saw one to feel free to pick it up. My friend joked that "How would we know if something was a race gift or someone's yard decoration...haha". We were off, I have to say that this was a very "fast" race, as most local races seem to be. I was running an 8:35 minute mile and I still had so many people passing me that I felt as though I was in the back of the pack. All of the on course volunteers were dressed in costume or holiday attire and that just added to the festivities of the race. After the first mile or so I realized how this gift thing worked. The volunteers who were on the course were holding them. 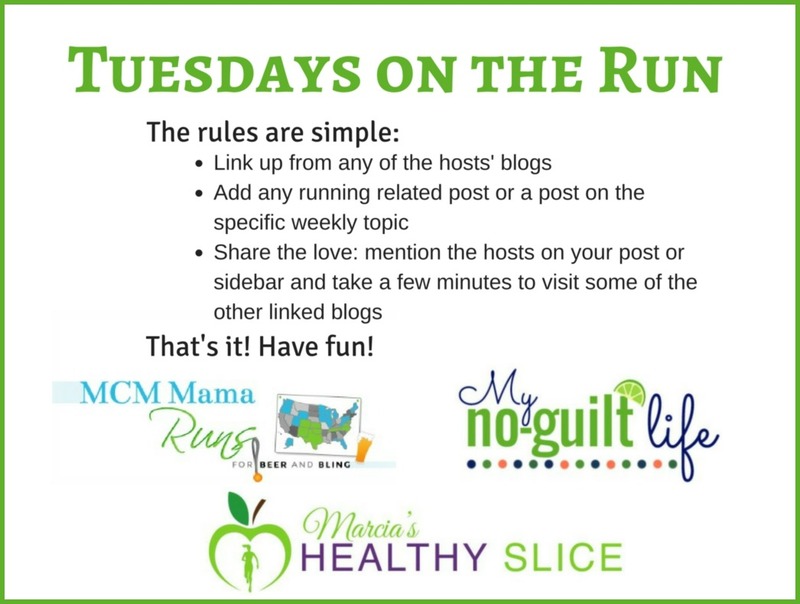 I saw one as I was turning a corner and as I went to run towards the volunteer I accidentally slowed down another runner and in that split second I thought I may trip her if I continue to run for the gift so I made the decision to just keep running on the course. I felt I was doing well anyway so I didn't feel bad not stopping. Before I even left my house I thought about bringing my hand held water bottle but then thought for sure they would have water on the course so I left it behind. Turns out I should have brought it because my mouth and throat were SO dry and there were no water stops. Another surprise on the course was a HUGE hill! We ran the hills of the local university. That was not fun. I ran the majority of it but just when we crested the peak of the largest one, I walked for a few seconds. Since I figured I was already behind my expected goal, I decided to just go ahead and grab the next gift I saw, except the girl in front of me snatched it first. This is my race buddy (see he's still wearing the hat) and behind him is Baylee's vet. Remember her from an earlier race this year? They both ended up placing in their age groups! I was happy with my finish time considering how over dressed I was and the surprise hills, but I didn't place. In fact, I came in 7th. Instead of medals, they gave out these adorable Christmas ornaments for AG winners. I had seen them on the race web site and hoped that they were available for purchase, but now when I found out they were the awards, I thought that was very cool. what a great memento from the day's event. I love the idea of Christmas ornaments instead of medals and they there were giving out gifts along the way. Great job with your 7th place finish with the hill and everything! Thanks! That hill really was steep and I'm not exaggerating either! The ornament was a cool idea and looks like it turned out to be a nice day for the race. My husband drove through that area when he bought our boat and he talks about how lovely it is there. It really is a beautiful area! I love the ornament for the AG awards! I bet the other runners wanted them too tho. I'd rather have that than a t-shirt! Yea, aren't those ornaments cute? Okay, what would ever make anyone think to NOT provide water stops? Even if it is winter. I think everyone tends to run a bit faster when it's cold out anyway, especially here in the tropics! And where did you get those socks? Do they actually stay up when you're running in them? So cute! I got the socks a few years ago at Target. Yup, they stay up just fine and I actually saw several other runners wearing the same ones! Sounds like such a fun and festive race! I actually like when smaller races don't have t-shirts and you can buy one. I have SO many race shirts now so I would rather have a cheaper race! Glad you had a fun run! I love the hat you lent your friend - really cute :) I really do like the shirts - too bad you couldn't get the red one! My fun run was after dark Saturday and it was pretty chilly, but I loved all the lights. I bet doing a run among the lights was fun! Oh man, I hate when there are no water stops. I'd panic. Its why I always take a water bottle with me until I see there are stops & then I'll toss it. Yes, in my race pictures I even look like that little kid. It was ridiculous. I should have shed some layers before we started. 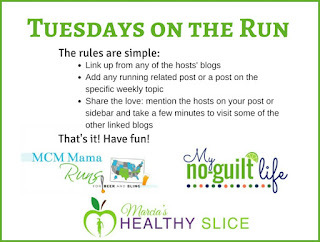 This sounds like such a fun race!! I want to do a holiday themed race, but timing hasn't worked with me this year! Did you get hot while running on all your layers? I can't believe you didn't get a shirt with your registration! I know I don't wear my race shirts, but it's still annoying when I'm denied one. I don't have a whole lot of long sleeve race shirts so that one would have been nice, especially since its Christmas themed! I love the ornament instead of a medal - Great idea! I used to do a winter race series every year when I lived in Denver - a 5 or 10 mi Dec/Jan/Feb, such a great way to stay in shape through winter! - and I definitely over-layered the first couple races. I hate being overheated though while running and so have erred on the side of less ever since. That's a good idea. Perhaps if I wear less I may run faster! I love any excuse to dress up for a run. I don't always make the best choices either. Looks like this one was a fun one for you and I love the ornament for the AG award! What? that dog does not even look real! I know right, isn't he cute? OK, now I'm curious as to what the gifts actually ended up being - any idea? Fun idea for a race, and the ornament awards were very cute. I can't believe they didn't have a water stop, though - it's like they thought of everything EXCEPT for that...kinda important, guys! I don't know for sure what was in the gift bags but I have a feeling they were the run lights gloves because the run lights people had a stand set up during registration and I read somewhere that they were going to be giving away so many pairs of those gloves. I actually have a pair of those gloves so good thing I didn't bother stopping if that was what was inside. That would be a cool gift if you didn't own a pair - do you like yours? I have been on the fence about buying a pair. I think they are a great idea but I don't use mine enough because I don't usually run in the dark. Mine were one of the first pair when they first came out so I think they've changed them a bit since then. It got seriously cold here too and I thought about skipping out on my race as well. Always glad afterwards though! Our race wasn't as cold as I thought it would be, was yours? Congrats again on your AG award! This race sounds like SO much fun!! I love the idea of gifts on the course and your ornament is so cute! It was actually my friend who won the AG award, not me. I had just as much fun though! Sounds like a great race! I love that the RD rides her bike to lead the race! I love that they gave you an ornament! Holiday races are fun but they can definitely be cold! Congrats! I actually wasn't cold at all during this race....Did you see how many layers I had on....lol? I was actually colder when I ran in Las Vegas a few years back. What a fun race! 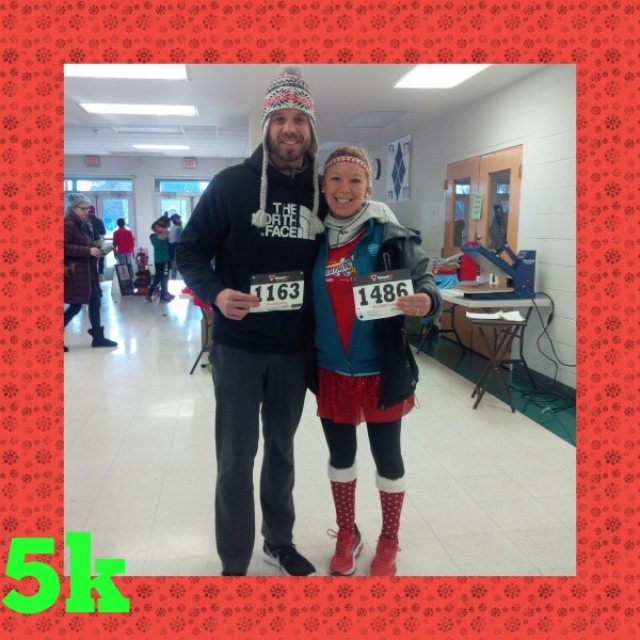 I love these local holiday races and super love your socks! I'm a little surprised they didn't have ANY water out there for you though. I do like the ornaments and the whole design of the race logo is really cute. You may have to grab a shirt next year :) Congrats on a great run! Thanks Lindsay! At least they had water at the end. My friend had one waiting for me and I chugged that thing down right away! The ornament is a cool little thing. 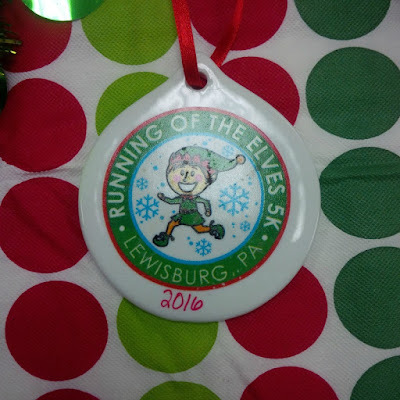 I like the Christmastown Dash in Williamsburg, because it's a race medal that doubles as an Christmas ornament. Adds a little uniqueness to it. I saw it though and immediately when "I know where that is!" because I went to school at Bloomsburg. I have actually never run a holiday race but last year I did a jingle jog that was pretty fun. Congrats on a speedy race! I love seeing runners in Christmas costumes! What a fun race! I struggle nailing cold weather running gear too! I hate being cold. That sounds like such a fun race! 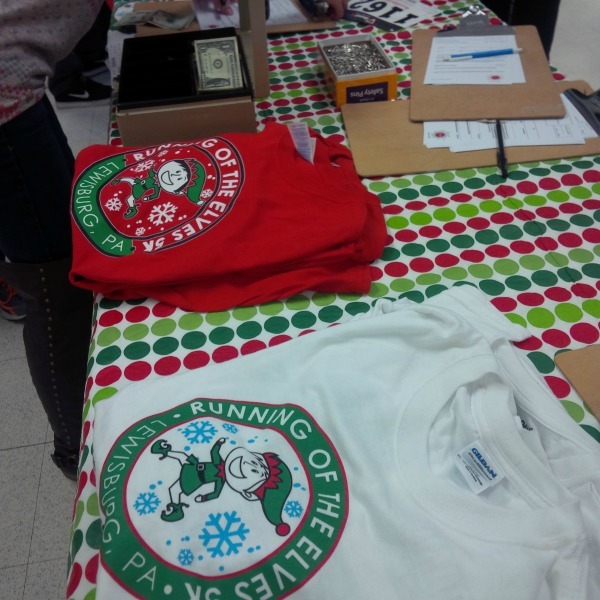 My holiday fun run includes a tee, but this year it wasn't even a tech tee. What is up, are races just going backwards in the tee department? I keep saying I'll be more festive the next year, but then I never want to buy something for just one race! Definitely run it with your dad next year. It will be a memory you cherish! I love holiday races. I haven't done a Christmas one yet, but maybe next year? I did a Halloween one a few years ago and those are so much fun. That dog is adorable!! What a great idea for an award-it's cute! Did only the AG winners get the ornaments? They are adorable and I would have wanted one! 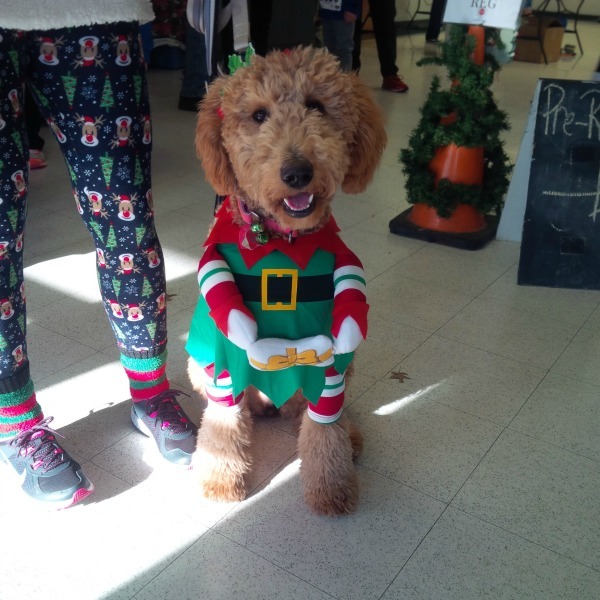 This sounds like a very fun and festive race and how adorable was that dog?! I can't handle being overdressed on a run - it's kind of suffocating! Sounds like a fun race even with a few probs (no water?!) so congrats on your finish! Such a cute dog! Congrats to your friend on the win! We don't have many Holiday races here in France. Most stop come December. There is one big one where most people are dressed as santa, but that's its. So no races for me. Things start up mid Feb. So fun, I used to do fun runs like this all the time years ago, no idea why I stopped doing them. Love your cute socks at first I had to do a double take I thought you found running boots, LOL They blend so well with your red shoes! lOL on the dog, some people get so creative with their pets! Awesome job! Those ornaments are such a great idea! I always layer like crazy in December too and then by January/February I finally have the correct layers for each temperature figured out. I think my body starts to adjust a bit to the cold, too!